A day on the water in Lewes, Delaware will be an adventure you won't soon forget. Catch a fresh fish or crab dinner for family and friends or venture out to the Delaware Breakwater Lighthouse on the inner breakwater for a birds eye view. You’ll get a chance to see the ospreys carrying their fish catch back to the nests to feed their families. Please observe the ferries from a distance as they have a very busy summer schedule… You can also cruise up the scenic Broadkill River, through miles of beautiful, winding marshland, with your fishing pole or crab pots, but don't forget to bring your camera. You'll see the many creative duck blinds constructed from the most primitive of supplies all along the waterway. The sunsets are breathtaking, so be sure to take the time to just sit end enjoy… Stormy, having been a commercial fisherman all of his life, had 16 fiberglass skiffs custom built with the fisherman in mind. 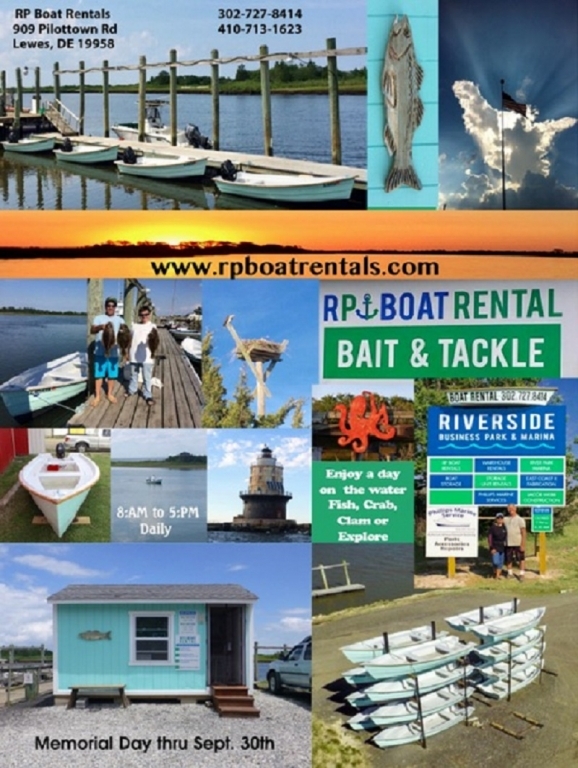 He personally hand finished each one for safety, efficiency and design... Have a safe and memorable experience with “RP Boat Rentals”. We look forward to seeing you and your friends in the near future. We are open seven days a week from 8:00 am to 5:00 pm, from Memorial Day to September 30th.